In recent years Joel and Ethan Coen have largely put comedy to one side to focus on existential explorations in more serious films like Inside Llewyn Davis and A Serious Man. While this has resulted in some great work, with Hail, Caesar! it is exciting to see the brothers return to the mode which brought us the likes of Raising Arizona, The Big Lebowski and O Brother, Where Art Thou. Unfortunately, this farce set in the golden age of studio Hollywood does not end up reaching those heights. When it comes to the films of Paul Thomas Anderson (Boogie Nights, There Will Be Blood, The Master) I have tended to appreciate them without really enjoying them. In the case of his latest, Inherent Vice, I can confidently say that I enjoyed it without really understanding it. Told through the eyes of the 13 year old Henry, Labor Day is the story of a five day love affair that took place on the Labor Day long weekend of 1987 between his mother, Adele, and a fugitive who sought refuge in their home, Frank. Crippled by her depression and anxiety, Adele rarely ventures outside. On their monthly shopping trip for supplies, they are accosted by a wounded Frank, who demands they take him back to their home so he can hide until nightfall. With his wound not allowing him to leave as soon as planned, Frank sets about making himself useful by performing the household duties that haven’t been seen to since Adele’s husband walked out. A bond is formed between them and, for a fleeting moment, the family feels whole again. 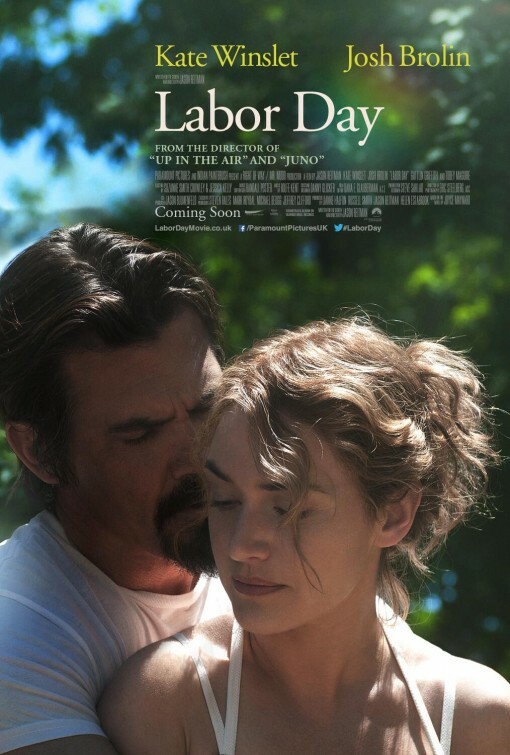 Labor Day is a movie which doesn’t manage to live up to its early promise and represents the first real misstep in the career of talented writer-director Jason Reitman (Juno, Up in the Air). While it is based on a novel by Joyce Maynard, the schmaltz gets dialled up so high you could be forgiven for thinking you were watching another Nicholas Sparks adaptation – the centrepiece of the film is a palpably sensual scene reminiscent of the pottery scene in Ghost in which Frank and Adele make a peach pie together. The introduction of Frank into the lives of Adele and Henry creates an intriguing situation, but the story that unfolds is just too simplistic. While they talk as though they are aware of the seriousness of their situation, they sure don’t act like it. If the police are combing the streets trying to find him, what is he doing up a ladder clearing out the gutters? Why do they spend so much time on the back porch or in the yard? Why don’t they at least close the curtains? That the lovers live in this dream world means that film lacks energy and because everything seems to be so easy, so convenient, the plot twists which are required in order to create drama then feel forced rather than arising naturally out of the story. Stockholm syndrome is a psychological phenomenon in which hostages have been known to empathise with, and in extreme cases fall in love with, their captors, and if all kidnappers were as perfect as Frank it wouldn’t be hard to see why. Having just escaped from a lengthy prison stay he has no issues relating to people, even complex and sensitive people like Adele, Henry and their disabled neighbour Barry. He easily steps into the routine of normal life, cooking up a meal for the family on his first night with them. With his handyman skills and wealth of wisdom he becomes a substitute father and husband overnight. Despite the fact he is convicted of murderer – don’t worry, that gets explained – not for one moment do we think he is going to hurt either of them. Were his character just slightly more complicated it would have gone a long way to helping the film become something quite interesting. Kate Winslet is magnificent as always, creating a believable and sincere character in Adele. Josh Brolin does well considering the limitations of his character, and the two make for a pleasing pairing. Ultimately, however, this is a film which you are either going to go with or you aren’t. Labor Day is a sweet little love story about two people who have been living in their own prisons and find freedom in each other, but to really enjoy it requires a willingness to overlook more than a few faults.